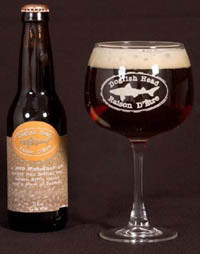 This offering from DFH pours a medium to dark caramel color, with an off-white head in the snifter. Clear body, no lacing. Aroma is of light grain malts with notes of barnyard - hay and raw barley. A unique taste, intially a light sweet moving to a moderately sweet finish. Tastes like hay, in a good way. Lively carbonation on the mouth, it is light with an oily feel and a dry finish, chalky residue feeling on the mouth.